January is the time for setting goals and making resolutions. Your goals should be simple and easy to follow through. Need some ideas for your list? How about making your car safer for yourself and everyone else on the road? Here are some easy tips to make your vehicle safer for everyone around. You will surely be able to follow through on your resolutions this year. You should always respect the law and wear your seatbelt when you’re driving your car. It’s pretty easy to forget about the belt when you’re “just driving around the corner,” but accidents can happen even in front of outside your home. Make it your resolution to buckle up every time you get into your car. About 50 percent of all crash-related injuries and deaths can be reduced by wearing a seatbelt. You should enforce a seatbelt rule for everyone onboard. Remember that younger children need to use safety chairs, there’s no getting out of that. If you own pets, be sure to keep them under some restraint or secured in a crate. Defensive drivers are able to anticipate dangerous and unexpected situations so they can respond ahead of time. The road can be full of potential threats, and you need to be prepared to deal with them. You might be the best and most careful driver in the world, but you never know how good or bad your fellow drivers might be. If you’re interested in learning how to become a defensive driver, check out these tips. It’s so easy to postpone your oil changes and just forget about changing your oil altogether. There are many ways in which your car lets you know it's due for an oil change, just in case you’re not keeping track of your oil change intervals. You should resolve to begin the year right and get a synthetic oil change. Fresh new oil at the beginning of the year will help you keep better track of when your next oil change is due. Switching to AMSOIL Synthetic Oil is the best thing you can do for your vehicle. You can even get an oil specially designed to prolong your oil change intervals like AMSOIL’s XL 10W-40 Synthetic Motor Oil, which you last up to 12,000 miles! Purchase your AMSOIL products online or call North American Wholesale at (866) 580-1008 to place your order. If you already know how to change a tire you can ignore this resolution, if you don’t, now is the time to learn. You should also learn to react in case a tire blows up while driving. FYI you should break slowly until you come to a stop in a safe area, where you can change your tire. Spend an afternoon at home teaching yourself how to change a tire. 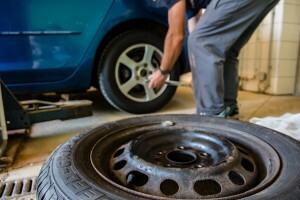 If your car comes with a tire-inflator kit instead of a spare tire, take some time to familiarize yourself with it too. You can also work on making your car more environmentally safe. Regularly maintenance, keeping your vehicle clean, changing your driving style, and even getting a synthetic oil change can make your car more environmentally friendly. We can’t all switch to eco-friendly cars, but we can make out current ones kinder to the environment. Vowing to keep a clean car can seem easy, but sticking to this vow can prove challenging. Start small by cleaning out your car every Sunday. Remove all the trash, excessive weight, and random stuff you carry around. All that extra weight you carry around makes your engine work harder and burn off more fuel. Try to wash the exterior to protect the paint and bring your vehicle’s good looks back. If you’re feeling like doing some more, you can wax the exterior as well. A wax will better protect the paint job. Start your year with an AMSOIL Synthetic Oil change. A synthetic oil change can help you make your car safer and even save you some money. Find everything you need to meet your vehicle’s lubrication needs at AMSOIL’s online store or by calling North American Wholesale at (866) 580-1008.